To smoothie or not to smoothie? It’s the plant-based fitness expert’s blog. Of course I’m going to tell you to cram as many greens and fruits in as you can, right? Not so fast. With an upsurge in ‘smoothies’ and ‘cleanses’ all over the web this time of year, for health, ‘detox’, or weight loss, it’s good to be mindful of why you might not want to make smoothies a part of your daily diet. Especially f you are trying to lose weight, or keep your weight in check, or have blood sugar and triglyceride challenges. Or satiety challenges for that matter. Blending and whirring vegetables and fruits as happens in the making of smoothies disrupts the fiber of the natural food. This disruption impacts the satiety value of that food. It seems, doesn’t it, that all of the fiber that was there before you blended it should be there in your smoothie. After all, you didn’t extract the juice from the apple, the spinach, the blueberries – you just blended it up. Fiber is fiber, right? It doesn’t work that way. Disrupting the fiber, as happens in the process of making a smoothie, exposes more of the surface area of the food. This means it is absorbed more quickly, making it more likely that it will effect your blood sugar and insulin levels. Not only that, but the more of it you want to consume. When the food is whole, or even chopped, we have more invested in the project of eating by chewing, an important part of the digestive and satiety process. These numbers of analysis should help. Studies comparing caloric intake at a meal following the consumption of either nothing (no preload), an apple, applesauce, apple juice (with fiber added), apple juice (no fiber added) delivered the following results. Though the apple, applesauce and apple juice with fiber all had the same amount of fiber, there was a clear (and significant difference) in the effect of these 3 forms of apple on satiety and caloric intake. The apple juice with fiber decreased calorie intake by 1% in the meal that followed. What is the take-away from this study? There is a clear difference between the satiety delivered by whole fruit and foods in contrast to the same foods blended, where the fiber is disrupted. I know that I can eat a whole lot of fruit if it’s blended. And the numbers from the testing detailed above explains to me why a smoothie breakfast doesn’t stay with me nearly as long as a my breakfast bowl of steel-cut oats topped with chunks of fruit. But if weight, blood sugar, and insulin levels are a concern to you, then the answer to the question “to smoothie or not to smoothie?” may be clearer. Occasional? Sure. Every day? Maybe not. This can probably be mitigated somewhat by limiting the amount of fruit and thinking ‘green drink’ rather than a smoothie packed with several pieces of fruit. First and foremost, I’m interested in getting people to eat more plants. And if digestion is a problem, or someone for some reason or another is unable to chew well, green smoothies with some fruit may provide a valuable source of nutrition. It may serve as a way to draw children in to loving their greens (see Smoothie, the Movie). And athletes may benefit from the large calorie load and fuel replenishment you can get in the form of a blended plant drink. Thanks so much for coming by and share your thoughts below. Please ‘like’ and share this post and if you’re on facebook, please join me now on my facebook page here: facebook. Thanks Lani! This helps reinforce my learning on fibre, calorie density, satiety, etc. The example was excellent, and very easy to remember – those results really say it all! Oh good – thanks! Examples always work for me too. Oops – meant to ask – how do you make that fruit ice cream – you’ve listed the ingredients, but any particular ratio – and no other liquid – and just put into blender (ok I know you have Vitamix but I use blender)? it just got my mouth watering, and I thought, what a great idea to do when ya just “gotta have that sweet”! Let’s see Paym – I don’t know! I put the frozen cherries in, then add liquid – water does it, can do almond milk for something richer – and whir the VM while tamping it down with the tamper. The idea is to keep it as thick as possible so it’s a sorbet and not soup. Add in carob powder to taste. Can add other fruit, too. A blender might make it harder to get it thick enough and blended at the same time. Yes, it’s a great go-to when you are thinking ‘ice cream’ but without the damage! Carob & cherries! That sounds amazing. I can’t believe I never thought of doing that myself. I too, don’t (yet) have a VM, but this would make a delicious dessert. Wow! We have a green smoothie in the morning since it is an easy way to get raw greens into my 2-1/2 year old son and it actually keeps us all (myself, hubby and lil man) quite full for hours. Do you have other recommendations for getting small children to eat raw greens. I typically use about a half pound of spinach, flax seeds, frozen blueberries, cherries, mangoes, bananas, and water with a splash of non-alcoholic vanilla. Would be interested in your opinion for other healthier options. 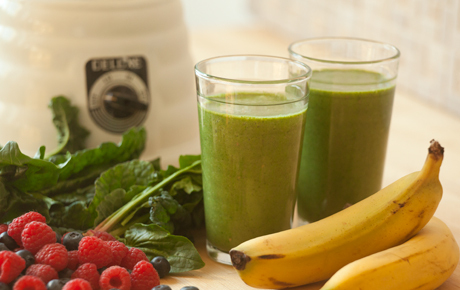 Are there any problems arising as a result of your smoothie plan? Are you trying to lose weight? If the smoothie works for you and no issues, and you can afford the calorie load, then it’s not as problematic. Be sure you aren’t eating all your greens this way though and stay in touch with how your body is responding. As far as kids, they can afford the calorie load usually and presents a different scenario as well. It’s easy to go overboard on the fruit in smoothies because they are so yummy and heaven knows it’s not hard to get our ‘fruits’ in – usually! You might try making your smoothies a little chunkier so that some chewing is involved, too. Sibyl, let me know how the oats come out. I’ve soaked them overnight on many occasions yet still cook it a little in the morning – sometimes with rolled oats you can get away with no cooking. I just soak mine in water to not add the fiber-free calorie load of almond milk. It was really good, I added banana and chopped apple, cinnamon and a touch of agave. It was chewy, but quite good. I have soaked rolled oats before, but it was just a bit too creamy for satisfaction. At the time though I was soaking in yoghurt. I no longer eat dairy, so I might like it better with water. I feel the steel cut oats are closer to being whole and I could eat it this way often. Sibyl, this sounds great and thanks for reporting in. I’m a texture grrl too so I get it! I am new to soaking and the plant based lifestyle. So here’s my question: If I soak rolled oats or steel cut oats (in water or almond milk) do I soak them covered and in the refrigerator? Or covered and on the counter? I just leave ’em out on the counter. If theyr’e in the fridge you just have to expend more energy resources to heat them up and they’ll be fine overnight. Congrats on launching your plant-based lifestyle journey! Stay in touch and let me know how else I might assist. Thank you SO much! I discovered your website last night while looking over http://www.engine2diet.com. I am excited to read your posts!! Hi Penny, I’m glad you found your way here and how fun to be connected both here and at Engine 2. Thanks for your kind words! Be sure to sign up for my newsletter and to download your Free Fitness Kit as well. This is great information…..AND, it triggers another question????? What’s your take on ‘juicing’? I’ve been hearing that chewing your veggies and fruits is the much better way to consume them. But, if that’s true, what about the people who say that ‘juicing’ is the better way. I’m confused. Can you help clear up the ‘juicing’ question? Thanks! Carol, in the sample with the smoothies, you see juice listed. Apple juice alone actually raised calorie consumption by 3% in the following meal. In other studies, the same result – the juuice had NO effect on satiety and simply added a calorie load to the meal. So, if weight and blood sugar are a concern (the juice without the fiber impacts blood sugar more dramatically), then this is helpful information. There are of course instances where juice may be therapeutic in delivering nutrients where fiber is not tolerated so well – perhaps during illness – but for most of us, sticking to the whole real deal obviously has its advantages. Also depends on ratio of veggies to fruits for both smoothies and juices. Can make a huge difference on the sugar balance! Our green smoothies tend to be much heavier on spinach/ kale, celery, cucumber, parsley, cilantro or mint, etc. and maybe a carrot, 1/2 an apple or pineapple chunks, or just a few grapes to sweeten. Our goal sometimes is to substitute an energizing green smoothie on a hot afternoon rather than default to a vegan frappucino w/ caffeine or a bowl of soy ice cream or something…LOL!!! In these cases, the smoothie is refreshing, cool, & healthier, and really can quell the craving for sweets/ caffeine. Especially on a hot day before or after walk/exercise. Lani – thank you for this – I couldn’t agree more – eating a whole food is so much more satisfying physically and mentally then drinking something. Hey Dianne, good to hear from you . I’d love an update on your Fit Quickies practice when you get a minute! Thanks for a very informative article!! I had never heard that blending compromised the fiber content of food – but from experience I know that smoothies don’t keep me feeling full for very long. Like another person commented, I find them such an easy way to get leafy greens & flaxseeds into my kids, and since they are all lean veggie kids, I’m not worried about the calorie load. But I think I’ll start having a smaller glass for myself, as I do have a personal weight loss goal. Rebekah, I think your thinking is right on about the kids. If there isn’t a weight or health problem, then it may be just the ticket for a busy mom. I find the same thing about smoothies – they can feel fulling at the time, but they don’t carry me as long as my steamy bowl. Thanks for sharing your thoughts. Nancy, great question. Which advantage is the greater? Perhaps if medicinal amounts were needed the breakdown might be an advantage, but for the rest of us if eating lots of whole foods we can count on good nutrition. I wonder if it will come up in the debate! At the McDougall Advanced Study weekend in February, both Drs. Fuhrman and McDougall will be there AND they are going to have a debate moderated by John Mackey, CEO of Whole Foods Market. I’ll see if I can float the question sometime during the weekend. Hey Natala, thanks for sharing your thoughts. You may know that Jeff Novick is my nutrition consultant – thank goodness he’s such a geek about investigating these things! When I first started making “green smoothies” they were more fruit than greens. But as time passed, they looked like this: spinach, kale, celery, parsley, 1/2 apple, 1 whole orange peeled but with the seeds, flax, water and ice. I was overweight when I started and had NO TROUBLE losing weight drinking the fruit heavy smoothie every morning for over a year. I only changed because my taste buds changed and I preferred a less sweet taste, plus, as my tolerance grew my interest grew in really upping the nutrient content of the smoothies. I can tell you that I never felt better than when I drank those smoothies every day. Oh, and my cholesterol plummeted from 231 to 147 on the sweet version smoothies. What can I say? I’m not a doctor or a scientist but also find myself at the center of this controversy as a blogger. Just as there are a now list of Docs against the smoothie, there are lists of professionals who recommend them. In fact, in a recent Doug Lisle lecture he was asked a direct question about green smoothies and he specifically said that people should look for other things to cut out of their diet if they are having trouble losing weight, NOT the green smoothie. So why Natala mentions Doug Lisle as being anti-smoothie is a bit confusing. I feel that with the restriction that we choose to place on ourselves eating the no-oil, very little processed food, vegan way, we had better be very careful about spreading fear about drinking green smoothies. They were a staple of my soup, smoothie, salad weight loss effort a few years ago that was a wild success. Now what, I should only eat soups and salads? Really? Sorry, but I want to make sure there is some solid evidence backing up these docs claims before I eliminate something that has worked so well for me in the past with real quantifiable results. Maybe the advice should be to severely limit the amount and types of fruit in the smoothie, but not the entire green smoothie itself? Hey Wendy, thanks for sharing your thoughts. On the list of dietary compromises, everything is relative. And if one were eating a standard American diet and switched out scrambled eggs and bacon for a green smoothie for breakfast, it’s certainly a change for the better – I think all the docs on the plant-based team would agree with that. Also, if you are having personal success with a green drinks, and you are not concerned about weight or other health measures that might be affecting it, by all means enjoying same may not pose a problem. The purpose of the article was to point out the potential problems that fruit and veggie blended smoothies may pose for some – problems of which they may not be aware. It may be slowing down a weight loss or contributing to blood sugar problems. Several responders on facebook and by email wrote to me to share problems they had encountered with weight gain or challenges with lasting satiety and they had never thought of looking to their daily smoothie before. This ended up being potentially quite valuable information for these people. Controversy is not a bad thing – it helps us analyze the data, look at our own results, and make decisions about our health. If smoothies are working for you – for example, they can be a great tool for athletes who are very active and need to find quick ways to get in more calories – then use that as feedback for your own choices. But if some of these other problems that blended drinks have been shown to present are part of one’s experience, then this is liberating feedback. I love my green smoothies (1/2 banana, 1/2 cup almond milk, flax seeds, spinach , kale and a few blueberries) but I did notice a spike and drop in my blood sugar level so I eat one piece of whole grain toast and I’m set for 4 -6 hours. It’s so much better than the diet coke and bag of mix nuts I use to eat. Happy breakfast. Victoria, you put it all so well! Thanks for adding to the conversation. Thanks. I raised my kids on a whole foods diet until they hit thier preteens. We got so busy with sports, school, etc… Blah, Blah, Blah. All terrible excuses. But here’s the awesome news. After all three graduated from college they realized they had adopted the western diet and they were not happy with it. I lost my way for a while also. Feeling tired all the time, not sleeping, gaining weight and having a fuzzier brain lead me back to a whole foods, plant based diet. My symptoms were all attributed to menopause. I was misinformed and I knew it. So the research began. This change was also fueled by 2 of my children returning home after college. We love it. We cook together. We meal plan. Share ideas and we try to eat together when our schedules allow. We are all getting along so much better. It’s quite an adjustment with kids returning home and now I know it’s possible to enjoy each other. A ray of hope for others. What a heart-warming and positive story Victoria. Menopause may be challenging no matter what you do, but there is a way to move through the process that makes a huge difference – how you eat and how you move. I love hearing how you and the kids have madethe food a fun and exciting adventure to share. How pleasing to you, also, as a parent! I have lost another few pounds after stopping the smoothies and am MUCH more satisfied for breakfast. Will have to take a look around your site, great info! So glad to hear things are looking up. Indeed switching out from all the smoothies has made a difference for many. Thanks so much for coming in to share today, I appreciate it! Bethany, thanks so much! I’m very happy to see you here and thank you for all of your thoughtful contributions. Please make this a regular stopping place! The “satiety” links are broken. I’m trying to remember the components: stretch receptors, weight in stomach, …? Hi Janice! Good to hear from you! How does it all go? Let me know if she works, OK? I explore this topic in depth in the book too, I think you’ll likey! I see your book’s release date is 2/5/13. Congratulations! That’s so awesome! Can’t wait. I’m eating lots of salads lately (yeah!) and sometimes I’m full but still hungry. It’s all very confusing. Thus my quest to read up on satiety. Ah – full but not hungry – you have to be sure there is enough calorie concentration with the food, not just the bulk which can make you feel like you might be full as in ‘no more room’ but you’re still not satisfied. You’ll love the nutrition chapter in the Fit Quickies book – I go into all of this in great detail because it made such a huge difference for me! Off to send you a copy of the article in question, too. Hi Lani, I’m devouring your articles and learning so much. Thank you for the time you took to educate each of us. One issue – the link above does not work, I get 404 notice. Could you send me an updated link or let me know how I can access this information. Thank you! OK, so my heart is pounding reading the article and link. Then as I scroll down and read the comments, beads of sweat have formed on my brow! I’ve been under the same assumption as Nancy, going by the writings of Joes Fuhrman. When I came across what he wrote, I was instantly relieved, as I detest dark leafy veggies cooked or in salads. I figured I could “have my smoothie and eat it too” since I make them with spinach, kale and other good veggies. But… The weight has been sluggish coming off… Now I’m really confused:( It is better to do without the health benefits of spinach, kale and other dark leafy greans, or do I “smoothie” them and risk not getting to my ideal weight? If I do everything else right, but make my salads with a lighter fair of lettuce, will I be nutritionally sound? Some seriously great chatter btw! Love it! Each person must decide what quality of diet they need to be able to meet their health and weight goals. Smoothies with lots of green may work just fine for you, and if they are helping you achieve your goals right now, then work on the other stuff. You can also cultivate a taste for things as you move forward. Find a green or two you do think you could take a liking too and start with a small bit in salad, steamed in your steam fry – the fiber full qualities have a lot to offer as well. I have no idea how much fruit you are using, or if your satiety through the rest of the day is affected by a smoothie practice. Take a look at what else you can keep improving and don’t stress out about it – all in its own good time. You’ll discover what is optimal for you. And make friends with a green or two! My usual and favorite way to eat kale is shredded and cooked into -my hearty lentil-onion-carrot-mushroom soup. Try it! Savory, not ‘greeny’ at all! I was just wondering what the outcome of the debate you mentioned was. It sounded interesting. I know it was some time ago, but if there are any articles or info you could share, I’d be interested. To put my own two cents in, I’ve been doing smoothies for about a month. I love them. I feel more energetic and clear-headed on them. My workouts have never been better; my energy holds out through the workouts better and I can push harder (doing hybrid of 2 intense beach body workouts). I see how satiety may change by processing the fiber, but for folks on a largely whole foods and primarily vegetarian diet, this may not be the biggest concern. For example, I eat many small meals throughout the day so I get plenty opportunity to refuel. And I eat a large mixed salad for lunch every day, plenty of legumes, whole grains, and lots of veggies at dinner. So, I figure I’m covered in the fiber department. I agree that if we start adding smoothies and continue to eat a primarily Western diet, smoothies could contribute to weight gain. I see my smoothie habit (cause I think I’m hooked) as a complement to my ever improving whole foods, plant-heavy (although not exclusive) diet. You are absolutely right that this is a highly individual affair. Some people who struggle with weight do better without a lot of smoothies, some people thrive on them. Pointing out giving it attention and consideration was the point of the article. Thanks for coming by to share your thoughts! Thanks so much! I see that no definitive consensus was achieved. Oh well. As you say, they mostly agree. I’ve only just found this site today, but I’ve ready 4 very informative articles. Thank you for sharing the info. Well, nice to meet you! How did we find eachother? If you are having good results, then that should be your guide. It must be frustrating to not have the guidance you are looking for from doc! Just got back from the doctors this morning. I am on cloud nine because In the summer my bp reading was 165. I drank green smoothies for breakfast and lunch for 6 months and lowered my bp to 130/82… I KNOW now they are good for ME!!!! Happy day today.. I will be glad to give info on doctor etc…..so glad I did this!!!! What a fabulous report and I am so excited for you! Food indeed is our best medicine. thank you so much for sharing your good news here today. If you would like to improve your familiarity only keep visiting this web page and be updated with the hottest news posted here. Will I raise my blood sugar if I don’t use fruit in my smoothies? I wouldn’t think so, but you should check your own reaction. Thanks for your question. Do you mean eating an apple is too much, and you get full? Is there a reason you are trying to eat more than you can eat by simply chewing – for example, are you unable to chew much? Same with vegetables? In other words, I’m not sure what the problem might be that you are trouble shooting. This all sounds reasonable. However, whenever I do a juice “cleanse” I always drop a lot of weight fast, I feel amazing, my skin is amazing and I can work out twice a day – no problem. I wake up crazy energized. Aches and pains go away. This just doesn’t equate to the concerns I read about juicing, and its more than a bit confusing. The longest I’ve just juiced is 28 days. Though, I always blend in 1/2 an avocado or mixed seeds and make sure the ratio of juice is much higher in veggies than fruit. I keep searching for someone to explain why juicing has such a profound positive effect, but most articles are like this focusing on the concerns like not getting the fiber, enough protein, too much sugar, etc. But I’ve tried most every diet out there, including Whole30, paleo, Danette May, Standard Process Cleanse, etc. Nothing compares to the positive affects of juicing. Though, it is a pain to prep and hard to sustain. My parents even did it for awhile and had to get off their blood pressure meds since it normalized their blood pressure. Anyone have any insights on this? If you are enjoying the results and lifestyle that the juicing regime brings you, then that is probably your best answer. We each respond differently to various protocols within plant-sourced nutrition. One thing you say does catch my attention, which for those of us who can gain weight easily could benefit from paying attention to. You say you ‘always drop a lot of weight fast’. To extend this comment, does it become necessary for you to repeatedly want to drop a lot of weight? Some of us find, as me, that any system that stimulates rapid weight loss makes it only temporary, and actually makes it easier to gain weight and the body more reluctant to stay trimmer. The body adapts to underfeeding by driving up the propensity for gain. Some people experience this more dramatically than others. Yet it is a reason I always precaution people about any system where they can rapidly drop weight.